Come visit the Emerald Coast Beaches in a luxury, two bedroom, two and a half bath, large, 1400 square foot, Non-Smoking townhouse. It is just a short walk (150yds or 2 minute walk) to the semiprivate beach access. Enjoy the sunrises and sunsets from the master suite balcony or the living room deck. Experience the convenience of overlooking the pool/hot tub and covered parking directly underneath. Unit #305 is a beautiful unit with NEW carpet, warm colors, new mattresses, updated furniture, and accessories. Unit sleeps 6-8. Spacious kitchen, living room, and bedrooms with separate laundry room. The master suite has a king size bed and additional sleeper sofa. The 2nd bedroom has 2 full size beds. An additional sleeper sofa is in the living room. Property features two pools and hot tubs and 6 grills. The Stuart's live in Kankakee, Il (located 60 miles south of Chicago). We love to travel; especially when beach time is on the agenda. Otherwise, we're dedicated to supporting the boys school and sporting activities. We've enjoyed visiting the Panama City/Destin area for several years and now wanted to have a permanent place to call ours, but with the ability to share with others too. When we first visited Santa Rosa Beach, we fell in love with this community which has great semi-private beaches, shops and restaurants without all the hustle and bustle. But, if action is desired, Destin or Panama City Beach are only minutes away. The Legends is a great location where you can enjoy the beach, pools, hot tubs, tennis courts, and sand volleyball. There are miles and miles of a paved bike path that is perfect for biking or running along 30A. Our unit is the most convenient directly overlooking pools/hottubs/courts and is in the building closest to the boardwalk. Very nice location, enjoyable time. Everything was in order. Condo was clean and very comfortable. Pool was excellent. Could use some new pots and pans. Also, need a new unrusty cheese grater. Would definitely stay again. Thanks for the review Diane. We strive to make sure everything is clean, in order, and up to date. We just replaced the pots and pans last fall, but will definitely take a look and see what else we might need to replace. Wasn't aware of the cheese grater being rusted so will definitely get on replacing it. Location was great. Easy walk to restaurants and the beach. Townhome was comfortable and clean. Thanks Christie for the great review. Glad you enjoyed your stay and surroundings. Have a great summer! While not the "beachiest" condo we've stayed at, it was above and beyond the best value for the proximity to the beach (we were on the sand with only a 3 minute walk down the street) and for the well-maintained pool and balcony view. We also enjoyed being able to walk to dinner and for ice cream one night. We were there for a girls' trip and would absolutely stay again! Thanks for your kind review Sarah. Glad it worked out for you and your friends. Keep us in mind and come stay for a week next time! Still lots to discover in the area. Thoroughly enjoyed our stay...we will return. The owners are very accessible and communicated very very quickly when we had a question, both before and during our stay - this may not sound like a huge benefit, but when you're out of town, away from home, and don't really have people to rely on, it's comforting to have accessible owners. The unit was very spacious, felt like a little home. Everything was clean. The master bedroom gets a little warmer than the other room during the day because of the sunrise on that side...definitely not a big deal and I get hot easily. No complaints about the unit. The beds/pillows were very comfortable. Shower worked well, dish washer worked well. Plenty of cookware provided. Clear water, white sand, decent waves...a couple of sand bars close by...pretty amazing. The beach was a short walk, it took maybe 5 minutes at most. Beach was clean and not over crowded. Plenty of room. Manta rays are spotted often...which was really cool. The beach was so close we rarely used the on-site pool. The pool was also very clean, and there were professional beach cleaners there at least 3 times (probably more often but I saw them 3 times). Hot tub outside worked well. Grills were easy to use (the one on the left didn't work so well). There were regular pool cleaners. There is a tennis court, volleyball area, tons of little stuff to stay busy with on the property. The unit is in a great location to get down to the shops, ice cream, restaurants, etc. Its a 5 minute walk. The unit is also far enough away from the entertainment to be very quiet at nighttime as well. Walmart and Publix (grocery store) are a 10 minute drive - so you don't need to bring much with you. Thanks Nathan for the great review. So glad all worked out for you! We are looking into tinting those bedroom windows soon to help eliminate some of that heat...not to mention to cost to run the air :). Anyway thanks again and keep us in mind for your next visit! Clean, comfortable, and a very relaxing atmosphere by the beach! We had a great time here. The unit is as described and provides a great location near the beach and the amenities of Santa Rosa Beach. I’d highly recommend it. Thanks for the review Mark. Glad all worked out for you! Come back anytime. Fabulous location! 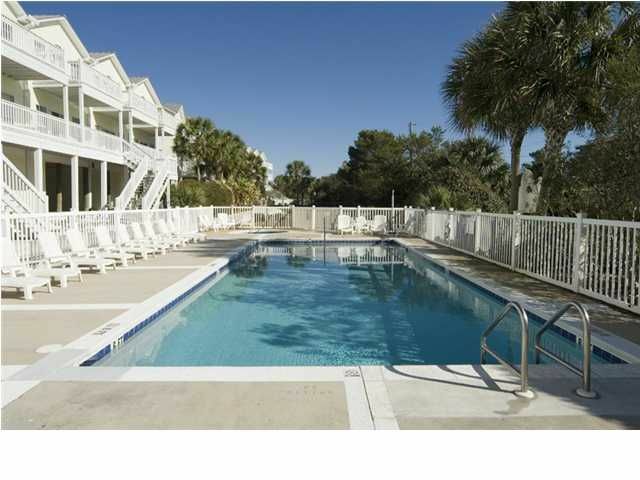 Very close to the beach and the pool right outside the door! Thanks for the review Priscilla. Having the pool right outside our door is a great amenity! Inquiry about nightly stay's (3 night min).